Reindeer, Rangifer tarandus, known as Caribou in North America, are a widespread northern hemisphere species of deer, which are found in the boreal forest, mountains and tundra. 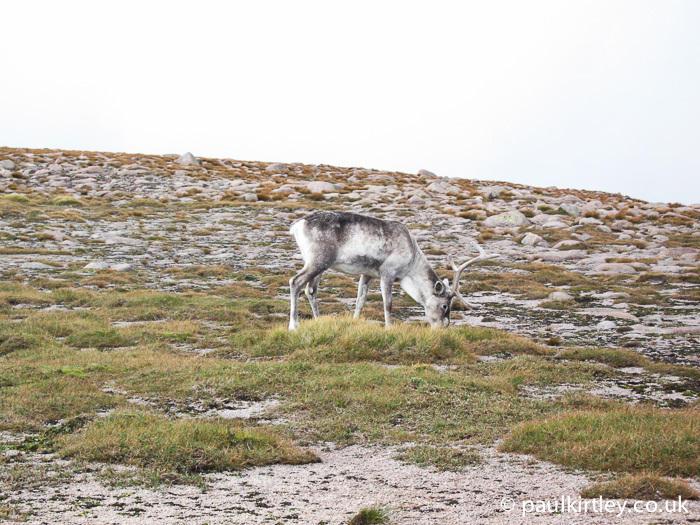 The sub-species most familiar in Scandinavia and Northern Europe (and which have been reintroduced into Scotland) are specifically Eurasian Tundra Reindeer, Rangifer tarandus tarandus, which occur from Fennoscandia all the way east through northern Russia to the Bering Strait. They are closely related to Alaskan Caribou, Rangifer tarandus granti, Barren-ground Caribou, Rangifer tarandus groenlandicus, Peary Caribou, Rangifer tarandus pearyi, and Svalbard Reindeer, Rangifer tarandus platyrhnchus, Eurasian Forest Reindeer, Rangifer tarandus fennicus and North American Woodland Caribou, Rangifer tarandus caribou. 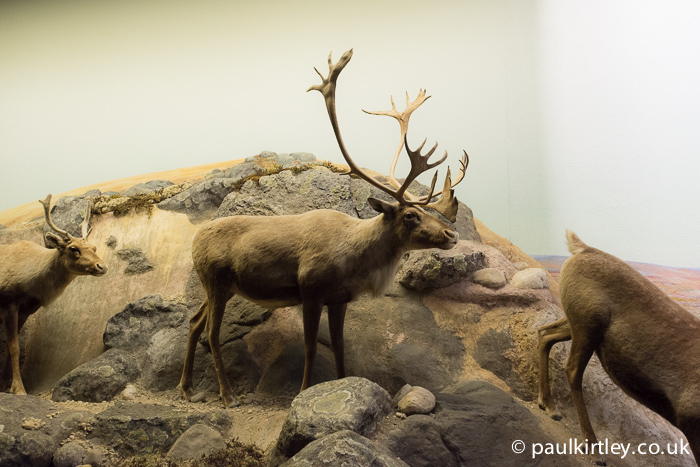 The majority of Eurasian Tundra Reindeer are semi-domesticated or domesticated. 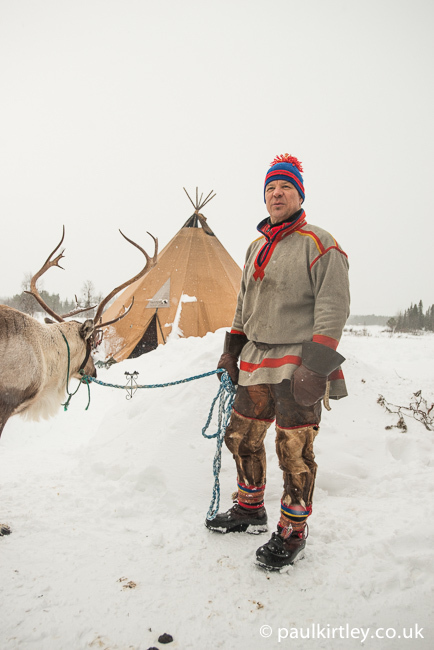 Indigenous northern peoples such as the Sami in Fennoscandia and the Nenets and Evenks of Russia have coexisted with and relied upon semi-domesticated reindeer for hundreds, if not thousands of years. Reindeer have been valued by humans for even longer, providing meat, skins, antler, bones, sinew and more to stone age hunters. 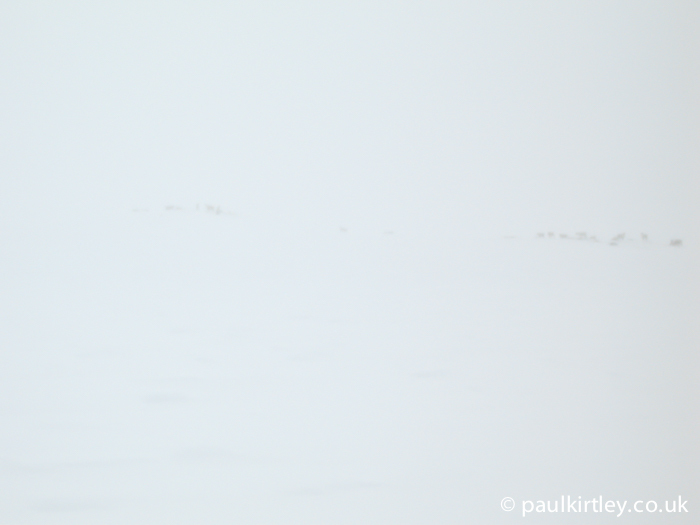 There are some wild herds of Eurasian Tundra Reindeer remaining. 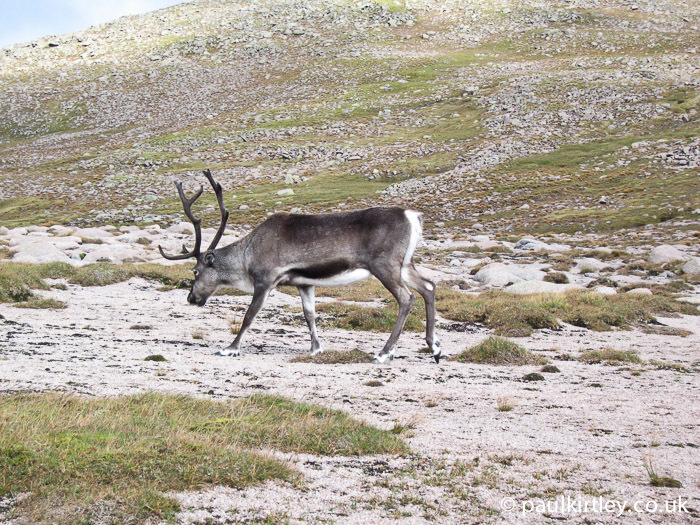 Norway has Europe’s southernmost population of wild reindeer on the Hardangervidda and in the Setesdal mountains. 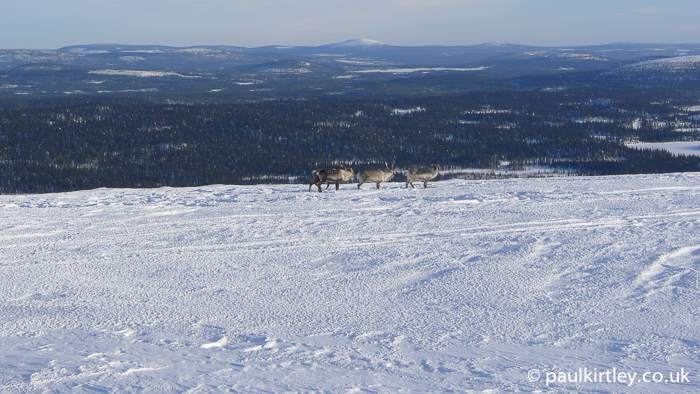 The first time I caught a glimpse of wild reindeer in Norway during a ski tour in the Setestdal Mountains, February 2007. Photo: Paul Kirtley. 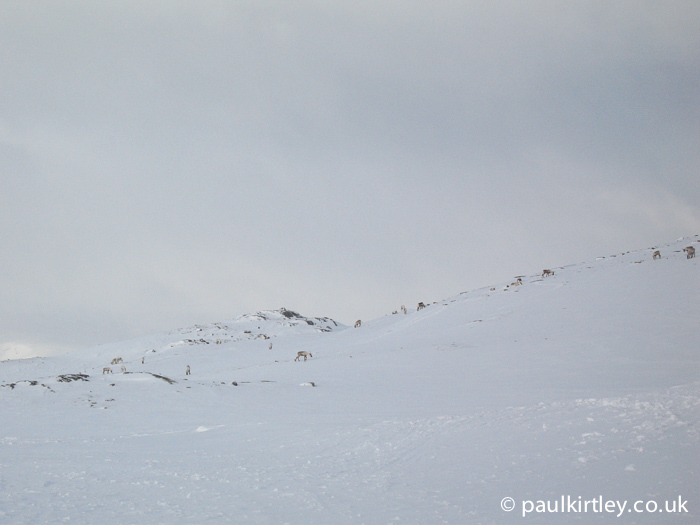 You may not have noticed the herd of reindeer in the photograph above. 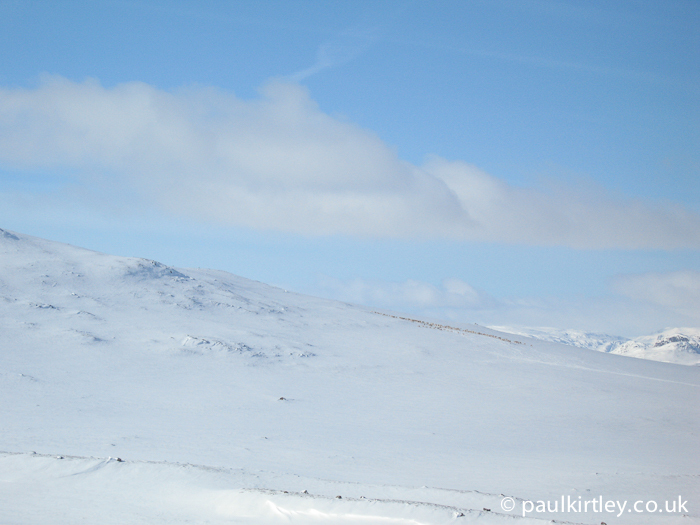 Here, zoomed in, you can see them just below the ridge line in the distance. 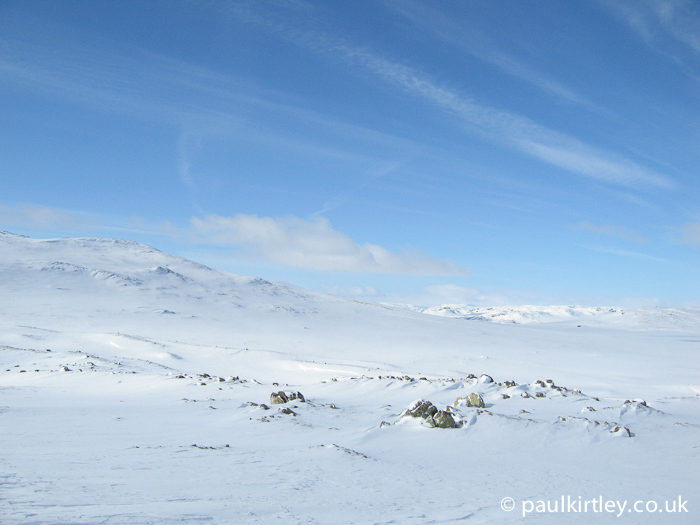 Setesdal Mountains, Norway, 2010. Photo: Paul Kirtley. Most modern Western societies associate reindeer with Christmas and the most famous of them is, of course Rudolph, with its fabled red nose. 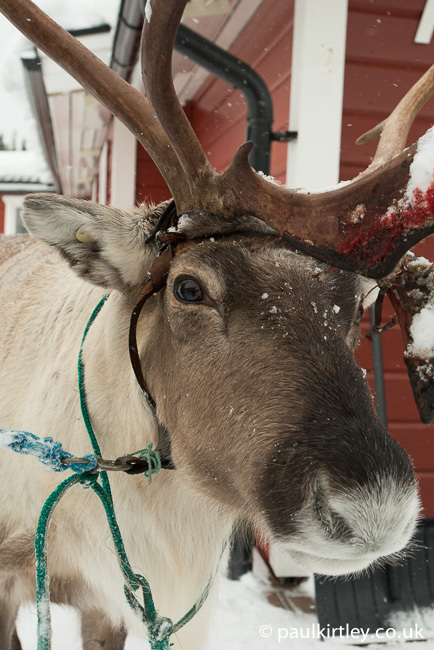 Interestingly though, unlike the vast majority of deer species, reindeer have furry noses. unlike the vast majority of deer species, reindeer have furry noses. Sweden, 2015. Photo: Paul Kirtley. 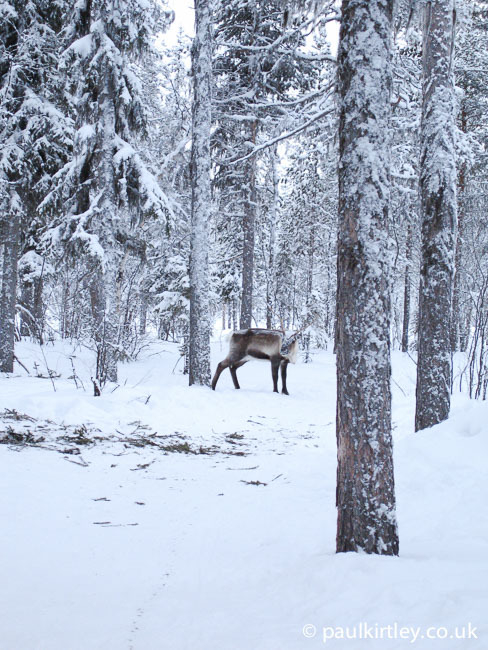 Reindeer are extremely well-adapted to the cold. 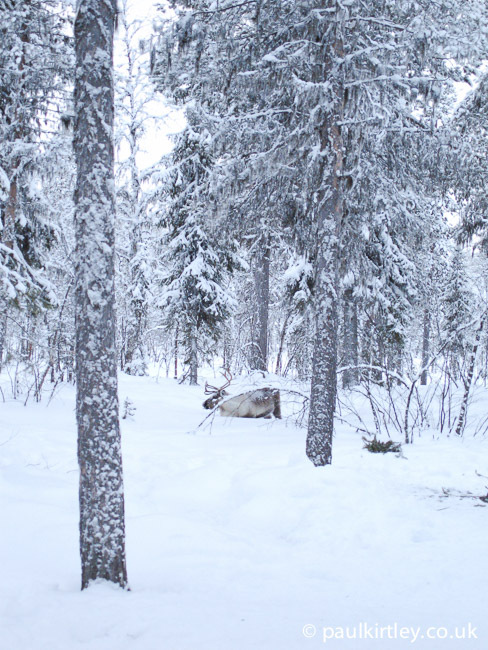 Indeed, reindeer fur is extremely suited to keeping the animal warm. Their hairs are hollow, containing air and their winter coat is thick. Reindeer even have a chamber for holding heat, and moisture, from their exhaled breath so as to warm and humidify the air they are breathing in. 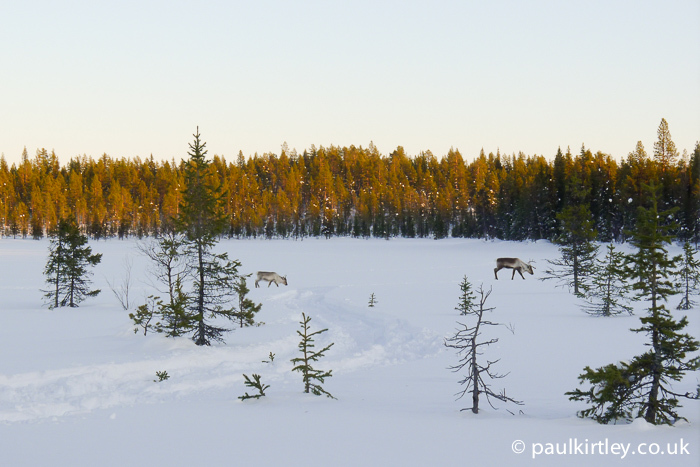 Reindeer can be in small groups as well as larger herds, These semi domesticated animals were spotted in the mountains above boreal forest in northern Sweden. February 2013. Photo: Paul Kirtley. People are often surprised that reindeer at not particularly big, especially without their antlers, I know I certainly was. What also surprises, though, is quite how big their feet are. 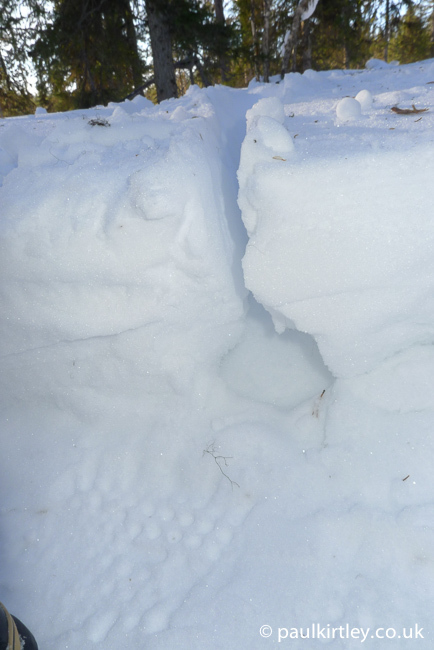 At first they look ungainly and out of proportion but if you’ve ever walked on snowshoes, you’ll realise how useful big feet are in deep snow. Not only are reindeer feet are quite large for the size of animal, they are also quite rounded, each side of the hoof describing a crescent, which make the footprint as a whole look almost circular. 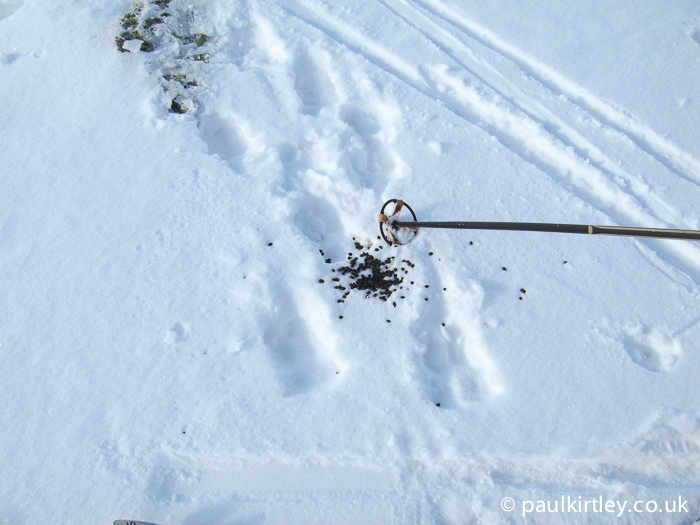 This makes reindeer footprints very distinctive in shape. 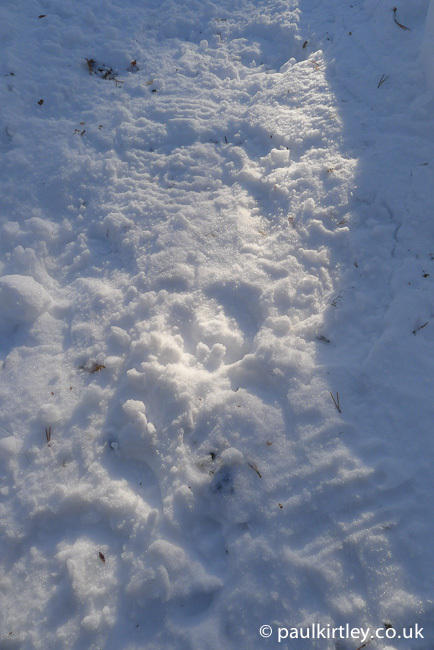 An additional distinction is that reindeer dewclaws are quite low down the leg and therefore often visible in the foot impression left behind, even on relatively hard surfaces. 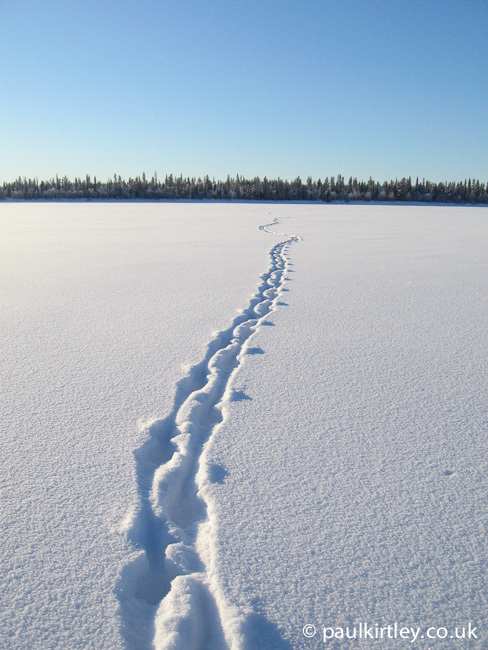 Reindeer tracks on a winter trail in northern Sweden, 2004. Photo: Paul Kirtley. 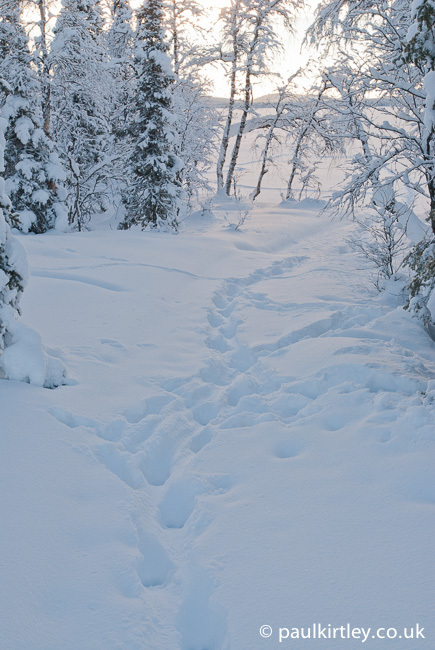 Reindeer tracks in the compacted snow of the mountains of Norway, 2010. Photo: Paul Kritley. 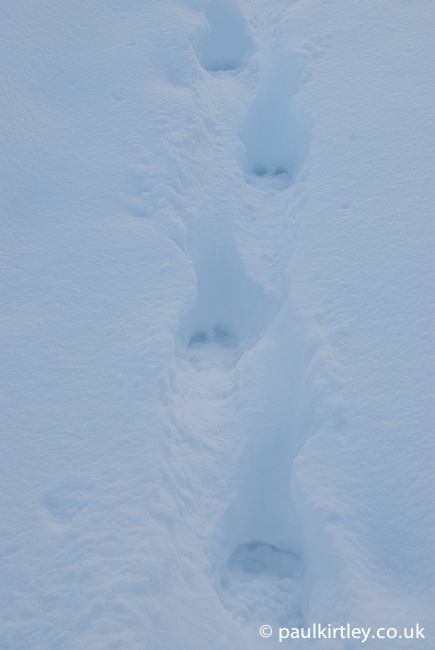 Here a perfect impression of the lower leg of a reindeer as it walks off our compacted snow shoe trail into the deeper, uncompacted snow. Note how large and wide the foot is. Sweden, March 2012. Photo: Paul Kirtley. 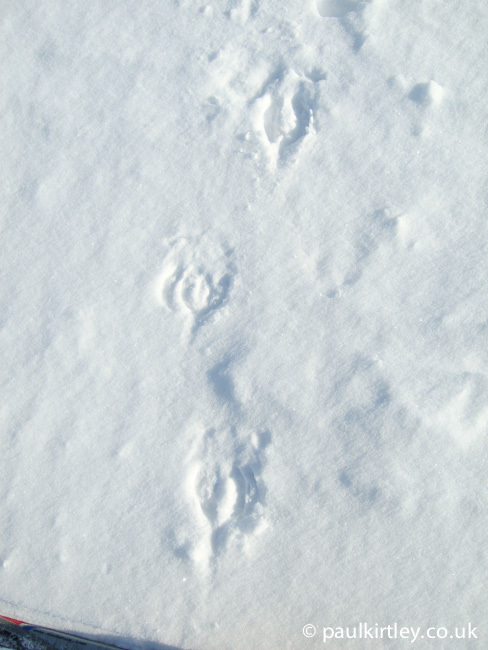 The almost circular footprints of the same reindeer as made the impression in the photo above. Sweden, March 2012. Photo: Paul Kirtley. 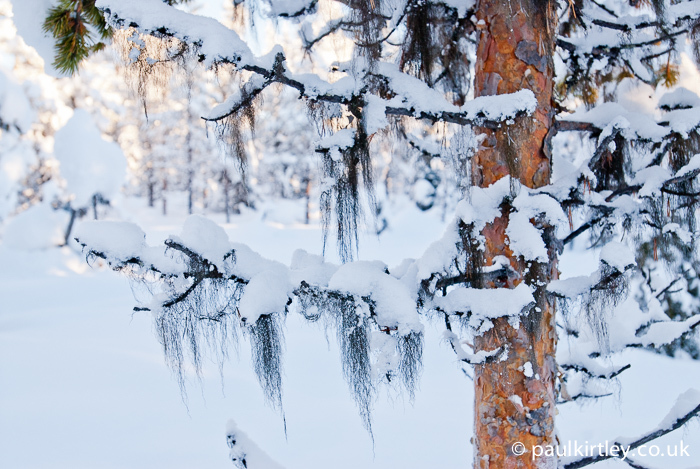 Reindeer feed on lichen, notably reindeer moss in the hills but also various species of “old man’s beard” in the forests. Indeed if you cut down a dead standing tree with lichen on its branches this can attract reindeer into the area to feed. Lichen above the level at which the reindeer can feed will have been brought down to the level of the snow and the reindeer really value this as a food source in winter. 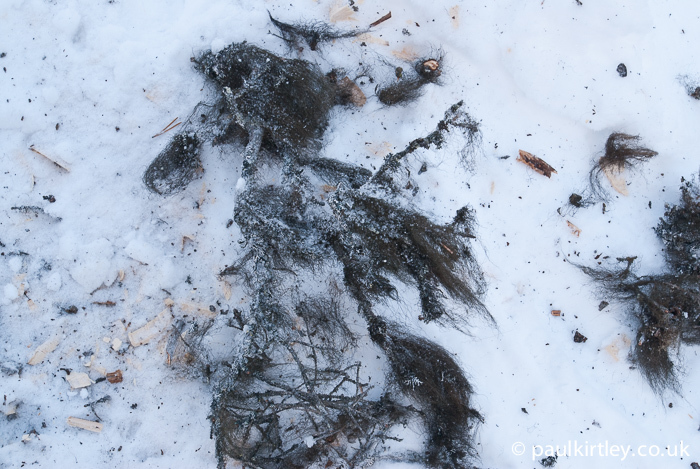 On numerous occasions I have harvested a dead standing pine for firewood, leaving small upper branches festooned with lichen in the snow. 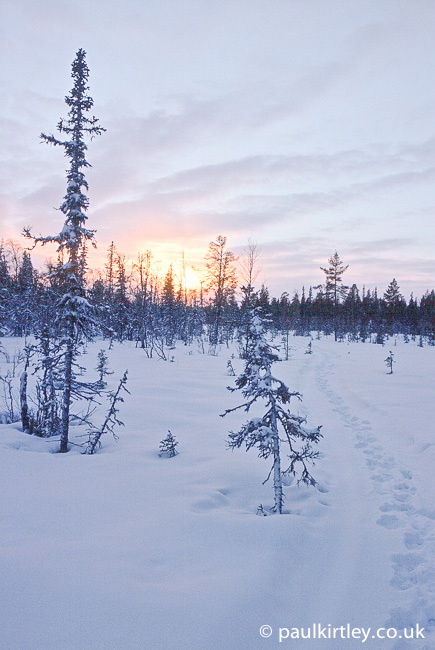 On returning the next day it is clear from the tracks and sign that reindeer have come into the area. 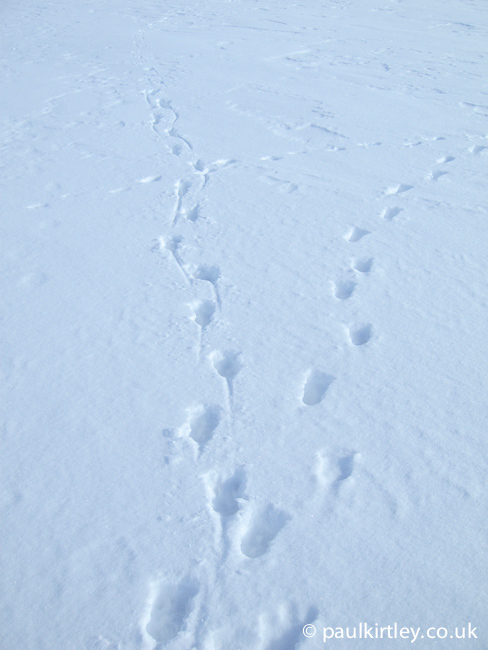 Lots of footprints and disturbance are the obvious positive sign. Plus all the lichen has disappeared – the negative sign! 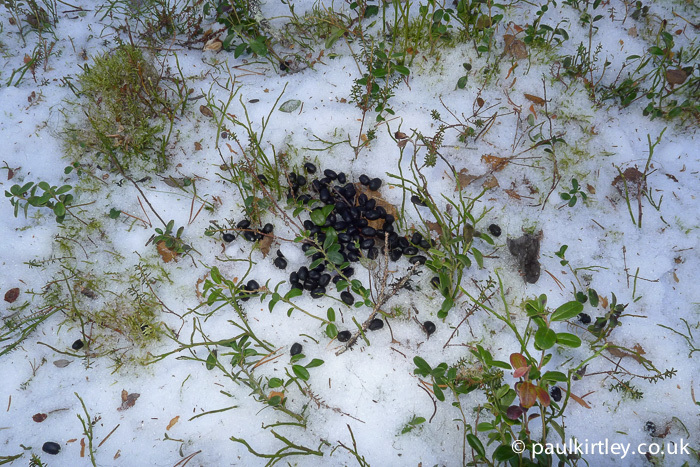 In forests, reindeer like to eat boreal lichens as well as ground vegetation. Photo: Paul Kirtley. 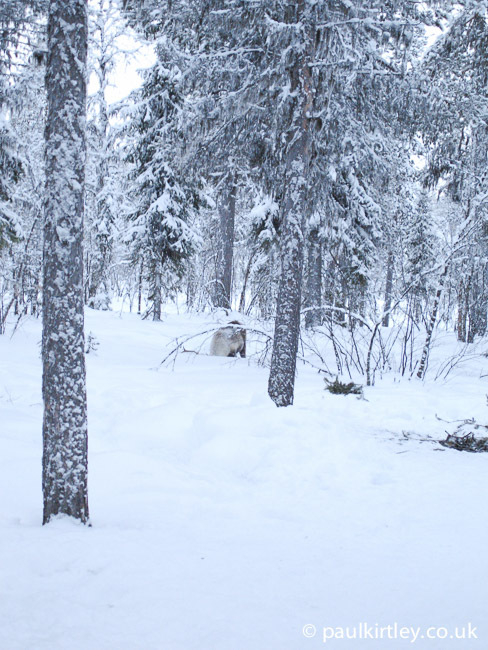 If you clear an area of snow in the forest reindeer can be attracted to the uncovered vegetation. 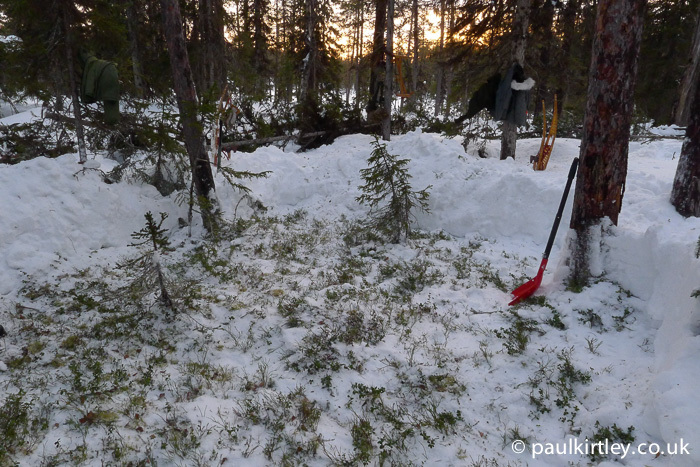 In my experience, this is particularly the case in years where the snow is very deep or if the snow has gone through several freeze-thaw cycles and is, therefore, crusty at some level or at multiple levels, thus making it hard for the reindeer to access what is under the snow. 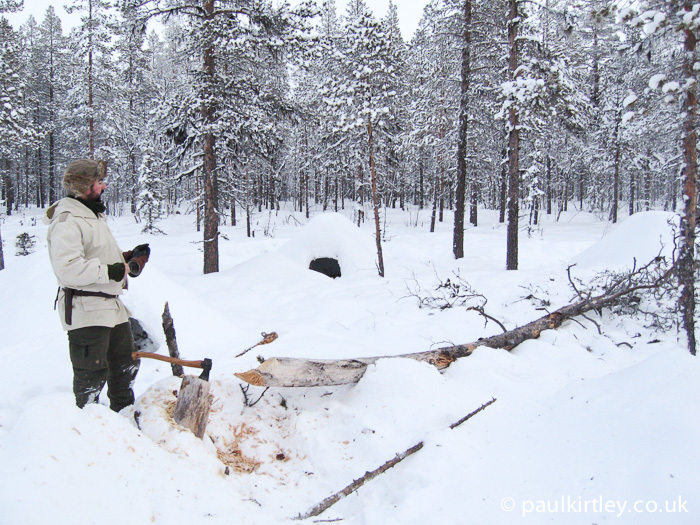 Areas cleared of snow can be attractive to reindeer, particularly in years where the snow is deep or crusty. Photo: Paul Kirtley. Reindeer are unique in that both sexes grow antlers. After the rut, females keep their antlers, while male deer drop their antlers. This gives some equality in competition for food. 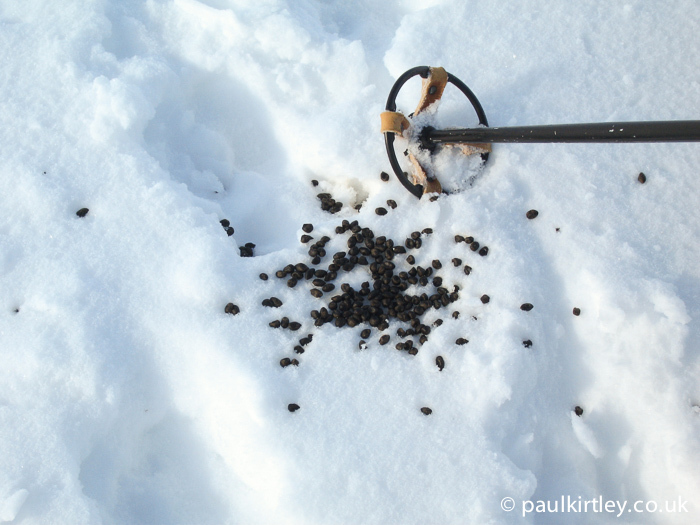 Some people also argue that it allows the deer to find more food, using the antlers to dig for vegetation. 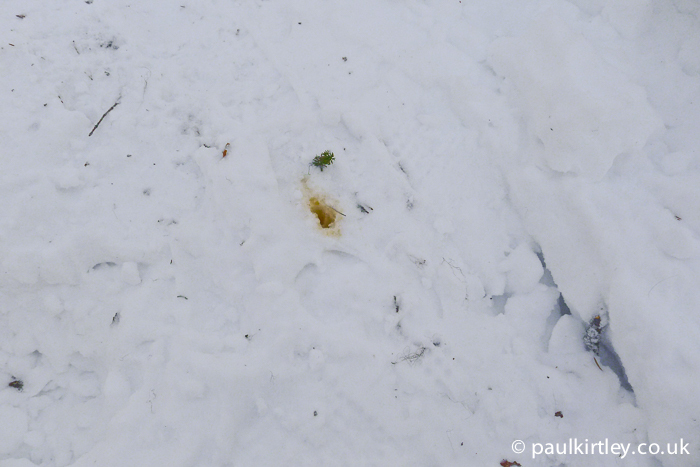 Where reindeer have been active, you will likely see droppings and, if there is snow on the ground, clear signs of urination. 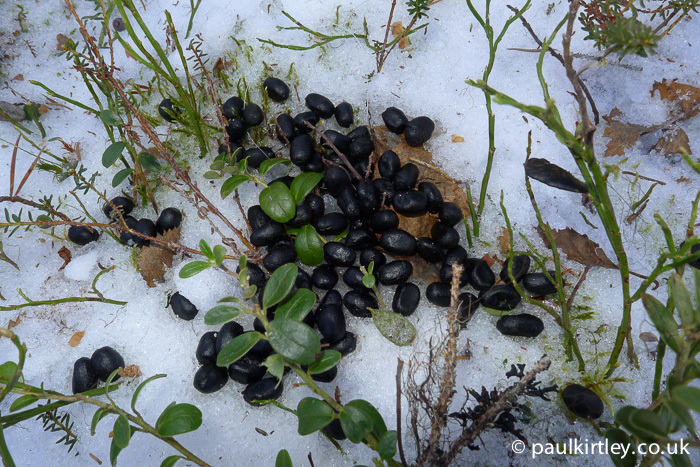 Reindeer droppings amongst tracks. Ski pole for scale. Norway, 2010. 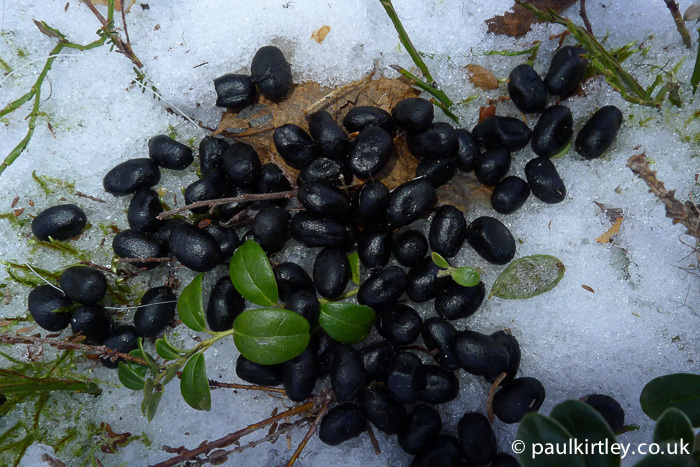 Reindeer droppings. Note the quantity. Also note the sign of urination. Norway 2010. Photo: Paul Kirtley. 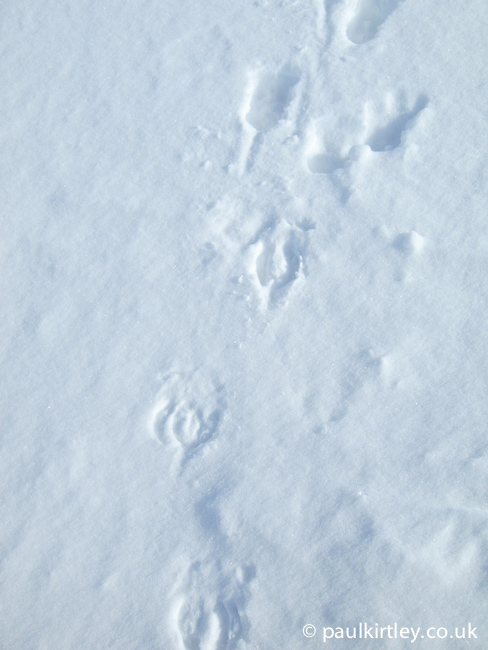 Here a reindeer has been active on one of our compacted snowshoe trails. You can just make out some of the tracks. Much clearer still is the spot where the animal urinated. This colouration is typical. Sweden, March 2012. Photo: Paul Kirtley. A lot of them have fur on their horns too, at least the ones that I have come across in Lapland in Northern Finland. And they are very fond of lichen, often digging for them. 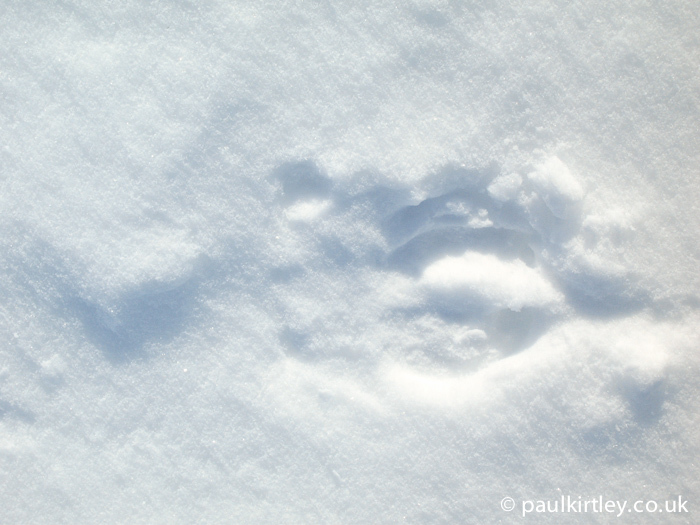 They seem to have a nose for them even when under 2 metres of snow. I wish you a good and happy new year!! Thanks Paul! I’ve seen caribou in Alaska and woodland caribou in NW Ontario. Really a thrill to see. I like how their tendons click when they walk also. This is good info you’ve given. Merry Christmas from North America. The reindeer is in-fact a caribou? I didn’t know this, very interesting as is all your world activities. 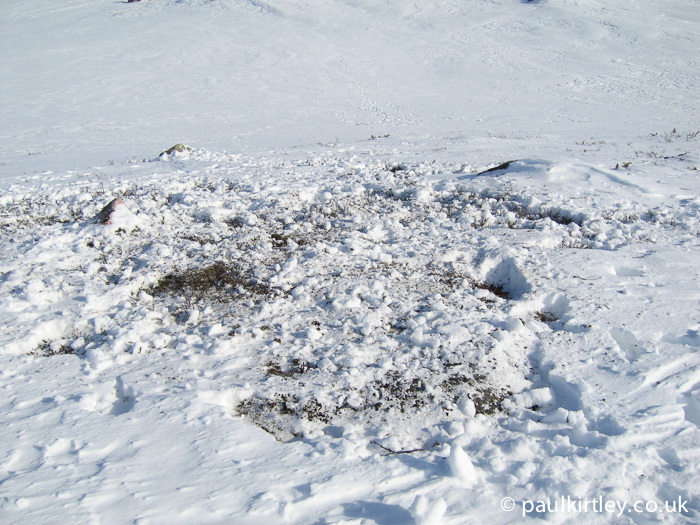 include look similar to the terrain of the Canada-US Pasayten Wilderness tundra above timberline.